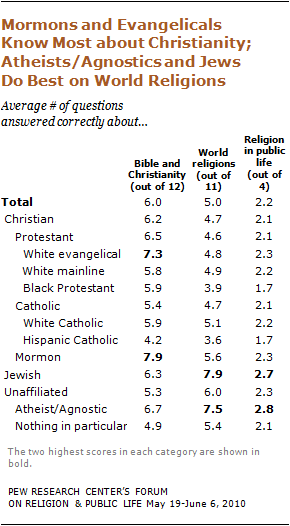 The Pew Forum on religion & public life posted the findings of a recent survey of religious knowledge. It has made quite the headlines today. You can read the executive summary and stats here. Several headlines I’ve read point out that atheists and agnostics “know more about the Bible than Christians.” Which isn’t quite accurate reporting. The study showed that Mormons and Evangelicals know the most about Christianity, but overall atheists and agnostics know more about world religions than any other group surveyed. The more I read through the study the less surprised I was. Evangelicals tended to know most about Christianity but little about other religions. Those with more education tended to score higher on the survey. Those that answered more of the general knowledge questions correctly tended to answer more of the religious questions correctly – showing a correlation of more education or knowledge emphasis in general. All this has me thinking about if we have any responsibility as Christians to know more about other religions and informing or encouraging our students to know more. Or does knowing the truth leave us content? Awhile back I was introduced to this video and it still makes me laugh from time to time. We laugh but I often wonder how many of my prayers and questions of God are right along these lines. So often my perspective is so small I can’t see past the polar bear question to see Jesus for who He is and what he’s done. The past couple weeks have been polar bear weeks, this week my perspective is wider – hopefully for a little while at least. Hello friends below you should find our update letter for September 2010. Endurance sports have been my thing for the past 5 years or more. Marathons, triathlons. 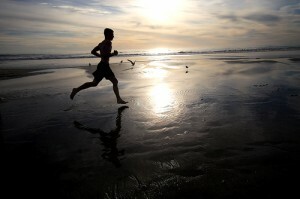 Running, cycling, swimming – when I talk about working out it is always one of those 3. Amy has started to get into it to. In a few weeks we will be running the Chicago Marathon together, it’ll be her first marathon. 18 weeks of training, a 1/2 marathon in the spring preceded by 12 weeks of training – she’s well prepared. These sports have such a magnetism for me. They require deep discipline and perseverance, a band of brothers to train with is often helpful. All these things are great, but it’s not that. Its how much they are an analogy for life. Its the job that you just can’t stand anymore, the unemployment you wish wasn’t. Or facing conflict with a loved one, apologizing when you’ve been hurt and hurt others. So often in life we have to do the thing we don’t want to do – we wake in the morning and would rather sleep in, but we lace up our shoes and run anyways. This analogy has come to life in a new way for me lately. Support Raising. Making calls, going on appointments, being away from home. All things I enjoy from time to time but often they are like the run I’m dreading. I know I’ll feel so much better when I get through it, but it’s so hard to get started some days. And then there are the days when everything comes together and you feel great – you finish 20 miles at your race pace feeling strong and fresh. Days when you wake and are ready to get moving. I generally pray for the latter but live in the former. You are currently browsing the nicknamy.net blog archives for September, 2010.